Located in Clifton, NJ, Legacy Tours NJ offers the best charter bus services around. This locally-owned family business has been active for nearly two decades, traveling all over the United States and even Canada. While they’re not afraid to conquer a long road trip, they frequently schedule road trips for your next school trip, senior center day trip to the casino, corporate outing, wedding, bachelor party and everything in between! No matter where you’re traveling to, this charter bus company will keep you safe and entertained as well as get you there on time. If you choose Legacy Tours NJ for your next outing, you won’t be sorry. 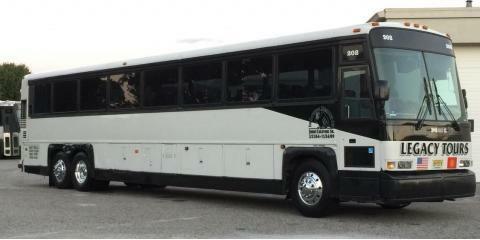 These deluxe charter buses are equipped with state-of-art air conditioning units and highly-maintained restrooms. Customers can rest easy knowing they’ll be in a cool, clean environment during their trip. The professionals at this elite charter bus company are always striving to ensure their customers have a great experience, as well as a safe one. The company has received excellent safety ratings throughout the years, and this is largely due to their team of skilled drivers who have been trained in proper navigation techniques for all weather scenarios. If you’re in the need of a safe and reliable transportation service, then don’t hesitate to call Legacy Tours NJ today! You can reach them at (973) 651-9784 during regular business hours, or if it’s an emergency, you can call their 24-hour hotline at (973) 986-5460.